Replacement Strain Gauge Load Cells are in stock and ready for fast shipment to you when you need them. We have a wide range of brand name load cells for your weighing needs. If you need a model number or capacity contact us and it's likely that we can either supply you the exact load cell you need or we can provide you with an interchangelable style that is virtually identical. Some of the brands of canister load cells that we stock include Rice Lake, Cardinal, Artech, Revere Transducers, Coti Global and Brecknell (Zemic). 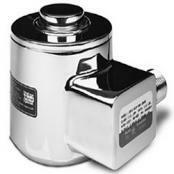 Canister cells are commonly used for single and multi-weighing applications. 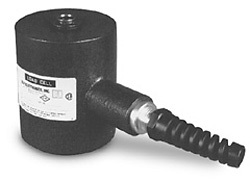 Compression canister load cells are great for high capacity weighing. These load cells are available in many different capacities and are commonly utilzed in vehicle weighing applications, and tank and hopper weighing situations. Because most canister load cells are hermetically sealed, they can provide very good environmental protection in hazardous environments. Below is just a partial listing of what we have to offer. Please contact us for product information, lead times and price quotes. Used primarily in truck and railroad applications, compression canisters are proven performers for demanding applications. Odds are that we stock the load cell you're looking for. Welded-seal canister cell designed for compression service only. High-capacity transducers built for reliability, durability and extreme precision. CP (Compression Precision) cells are recommended for most industrial applications. Capacities available from 10,000 to 500,000 lb (4535.9 to 226,796.2 kg). Integral 30'/9.2 m cable. The Sensortronics 65114 was specially designed to provide the superior protection of stainless steel and hermetic sealing for truck scale applications. This model is built to provide a high degree of accuracy, while protecting against the severe conditions that truck scale load cells often endure. The easy installation of rocker column type load cells also provides a distinct advantage over traditional market alternatives. Available in three different heights, this product can easily be adapted to existing applications and is NTEP approved. Tension canister devices operate similar to an s-beam cell, but are used primarily in tank and hopper applications. Contact us and we can provide you with with the right tension canister for your operation. Single-column, environmentally-protected design provides low deflection and trouble-free operation. High-alloy, epoxy-coated construction yields trouble-free performance in harsh environments. Designed for high-capacity tension applications. Capacities of 20,000 and 50,000 lb (9071.9 and 22,679.6 kg). Integral 35'/10.7 m cable. These load cells get their name from their "s" shape. S-Type cells provide an output under tension pull. Applications for S Beams include hanging, tank level, hoppers and truck scales.